Freedom 251, a smart phone project for launching world's cheapest smartphone at price ₹250 (less than $4) . During the launch last month in the presence of veteran Bharatiya Janata Party (BJP) leader Murli Manohar Joshi here, Ringing Bells unveiled “Freedom 251” and distributed some “prototypes” to the media which turned out to be Adcom handsets, said Adcom’s founder and chairman Sanjeev Bhatia. 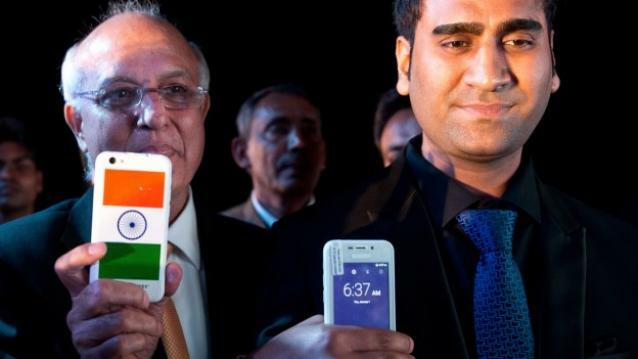 Ringing Bells president Ashok Chadha later told IANS that they only gave Adcom handsets as “samples” to a section of the media and the real “Freedom 251” will be a new product with all promised features. “We are deeply grieved by this incident where our mobile phone has been presented to masses for Rs.251, and therefore, would not hesitate from taking any legal actions against the company, in case the entire fiasco impacts Adcom’s brand name or subsequently we face any other kind of losses,” - Bhatia said in a statement on Friday. “Yes, it is true that although we sold the handsets to Ringing Bells earlier, like we sell Adcom mobiles to lakhs of users, we were absolutely unaware of the reselling plans of the company in question,” he added. “Furthermore, we still haven’t been able to evaluate their pricing policy as we sold the handsets at Rs.3,600 per unit (to Ringing Bells),” - Bhatia said. “It is also requested that our sudden rise should not be misconstrued as a fly-by-night operation. The company has already instructed the payment gateway to refund the few online payments that came in on the first pre-booking. The mode of payment now will be only cash on delivery,” - Chadha said in a fresh statement issued on Friday. “The orders placed by the customers are not cancelled but the payment will be taken only on delivery. Ringing Bells hopes to begin deliveries of Freedom 251 by around end of April,” he added. Earlier, the Noida offices of Ringing Bells were found shut on Thursday over land ownership issues with Noida Authority. Ringing Bells said they should not be dragged into any controversy over this issue. “While speculation is rife regarding the legitimacy of our occupying the premises we operate from, i.e. our corporate office at B-44, Sector 63, NOIDA 201301 in Uttar Pradesh, we wish to make it clear that the current dispute regarding the nature of business conducted at the property is between NOIDA authority and our landlord,” - Chadha wrote. The Enforcement Directorate (ED) also questioned Mohit Goel, CEO of Ringing Bells, this week over the pricing of the smartphone. “This is not a government project. ‘Make in India’ team has nothing to do with this,” - wrote Amitabh Kant, secretary of the department of industrial policy and promotion (DIPP), in a Twitter post.